The Marlin 60 rifle is a classic rifle. Few other rifles come to mind when thinking about an ideal first rifle. Many people started on these tube fed guns chasing squirrels and shooting tin cans. There’s something nostalgic and handsome about these guns. Plus, they are just begging to be taken into the field and be used. If you’re going to be shooting and plinking for very long though, you’ll want an optic. There are countless aftermarket fiber-optic sights for Marlin 60’s but nothing quite compares to a good rimfire rifle with a well sighted in optic slung over your shoulder when you are out looking for squirrels in the fall. If you are looking for the best scope for Marlin 60, here are the best five you can get your hands on. The topic of magnification always comes with the mention of buying optics. Rimfire rifle optics are a little bit different than scopes for centerfire rifle mainly the size of the target you are going to be shooting. Although you will normally be hunting well within 100 yards for game or targets with a rimfire rifle, the size of the targets you will often be shooting is quite small. While it is conceivable to hunt deer at 300 yards with a 9x power magnification scope. You’ll be hard-pressed to hit a squirrel at 100 yards with 9x magnification. The targets are just too small and blend in too well with their environment to be hunting with low magnification. If you are going to be hunting at long ranges with your rimfire rifle or competing at target shooting, consider more magnification than you would typically have on a centerfire rifle. However, the Marlin Model 60 is not a winner for accuracy by any means. Typically, these guns will shoot 2 or 3moa making their effective range on small game about 50 yards. Use this to your advantage and buy a slim and trim rifle scope with low magnification that you can move through brush easily with. Otherwise, you will ruin the handling characteristics of the Marlin Model 60, arguably one of the best carrying guns in the woods. Definitely, the best carrying rimfire rifle ever made for hunting and outdoor use. Nikon needs no introduction. They make optics for just about every industry including high-grade medical equipment and eye glasses. They specialize in putting out high-quality optics for excellent prices. This scope is an excellent example. It is from the pro-staff lineup and is a rimfire rifle scope specially designed with a BDC reticle and huge 40 mm objective lens that is extremely bright and easy to hunt with. Much like its larger centerfire cousins, Nikon didn’t cut any corners when it designed the scope. It is a rimfire rifle scope at heart, with parallax settings and a quarter inch at 50-yard adjustments for windage and elevation but is a full-size scope. Not many scopes designed for rimfire rifles are full-sized, simply because rimfire rifles are often made in youth patterns or are ultralight designs. If you have a hunting or target rimfire rifle for an adult, with a full-size stock, this scope makes a lot of sense. It is full-size and much heavier than most rimfire rifle scopes and balances out an adult sized rifle much better than other scopes. That feature alone, combined with the excellent optical quality and BDC reticle make this one of the best overall rimfire scopes on the market, and perfect for a Marlin Model 60 that is going to be used a lot. Vortex Optics makes some of the most innovative and interesting designs on the market. They are also known for making ridiculously rugged products backed up with an excellent warranty. This scope is no different and is one of the best scopes for a Marlin Model 60. Especially if you are going to be hunting with your rifle, you can’t beat this rifle scope. It has decent optical quality combined with a good magnification range and smaller objective bell than most other scopes. This makes a compact scope perfectly sized for a Marlin Model 60. It is on the heavier side, but that weight goes towards making this optic bulletproof. The lenses are fully multicoated, the adjustment knob is easy to use and the adjustment knobs are low-profile and largely out of the way. It’s very difficult to see any flaws with this design. It’s perfectly balanced and for the cost is one of the best scopes you can get. While there are higher dollar scopes on the market that offer more features as a pure hunting optic to put rounds on target and ethically kill small game, this scope can’t be beaten. One of my absolute favorite scopes, it is well-rounded and easy to use on your rifle. Bushnell makes a ton of different optics that can be found on the shelves of Walmart to the rifles of elite military and law-enforcement units. Many of their rifle scopes are made for particular applications and this particular scope is made for rimfire AR 15’s. Although the Marlin Model 60 is a lightweight tube fed rimfire rifle, it shares a lot of characteristics with the AR 15. It is a short light carbine that benefits from slim and trim optics, much like this 22 BDC rimfire scope from Bushnell. This optic is lightweight and well-balanced, featuring a few amenities that make shooting to long-range with a rimfire cartridge much easier. Mainly full-size target turrets and especially designed BDC reticle. The optical quality and magnification of the scope are both excellent and the build quality is very good for the price, you should have no trouble hunting or target shooting out to extended ranges with this scope. The lenses are fully multicoated and the large objective bell makes for bright shooting all the way to the end of legal shooting light. While this may be designed for the AR 15, it is an excellent scope that is going to fit well on your Marlin Model 60. Especially if you are looking to do any hunting or target shooting with your rifle. This model from CVLife is a great option for hunters looking for a low-cost optic that still performs well in the field for tasks like plinking and small game hunting. This is an imported optic from a decent company that puts out a ton of different optics ranging from low-cost budget plinkers like this scope, to extremely high end sniper rifle scopes. This model, in particular, is great because it is a classic 3 – 9x40mm scope that is comfortable to use and has a few extra features. Unlike most budget oriented rimfire rifle scopes, the optics in this scope are fully multicoated and perform well in low light. Particularly thanks to the huge 40mm objective lens that is rarely found on rimfire optics. The magnification adjustment is silky smooth and dialed in and out very well and the entire scope has good build quality, especially when you consider the price. Making this even better value, this scope comes with pre-installed rings and Alan key. You could literally take this to the range, and while you’re there install and site it in and have no problems hitting targets at the very edge of the .22 LR’s ballistic range. If you want a fully featured but budget oriented scope there are very few scopes that perform as well as this one does, for the price. Barska puts out some the most budget oriented scopes on the market. Many of them lack features or quality and are hard to use. This model though is a diamond in the rough. Mainly because most people who use old Marlin Model 60s use them exclusively for plinking or training new shooters their first time on the range. If you are using your rifle for menial tasks like this, it makes little sense to buy an extremely high-quality optic. This model from barska will get the job done for cheap. This is an inexpensive scope, to begin with, but it also comes with pre-installed rings so that all you have to do to take it out of the box is screw it on and zero it. The scope itself is extremely lightweight and compact, sitting very low to the bore axis and is perfect for a lightweight gun like the Marlin Model 60. The drawbacks to this optic however are the low-quality optics, small field of view and fragile construction. You do get what you pay for, and this scope from Barska cannot be abused and needs to be worked around if you plan on doing anything but simple target shooting. The low field-of-view is hard to hunt with because of the low situational awareness and the aberrations in the optical quality can lead to headaches if you use the scope for too long. However, for a very informal target plink or to slap on to an old Marlin Model 60, it’s great, there are very few scopes that can do this for cheaper. 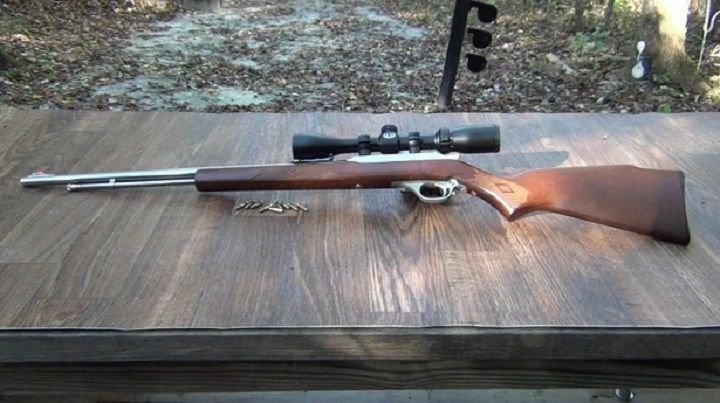 If you find a centerfire rifle scope that you like better for your Marlin Model 60, use that. Centerfire rifle scopes, although overbuilt for rimfire rifles, can be used just fine. However, you cannot use a rimfire rifle scope on a centerfire gun. They just won’t take the abuse and recoil from the substantial power increase. Just remember, centerfire rifle scopes tend to be much heavier and bulkier than those designed for rimfires, and the extra-mass and size can ruin the handling characteristics of your rifle. That includes bulky rimfire rifle scopes as well. Although there is a ton of newer scopes on the market that are absolutely excellent and purpose designed for rimfire rifles, if you have an old rifle scope sitting around or if you love a centerfire scopes so much you want to use it on all your rifles, don’t hesitate. Just don’t sacrifice the handling and performance of your rifle by reusing an old or broken scope from a different gun. If you are looking for a cheap optic to go plinking with, or a high-performance rifle scope to compete in rimfire competitions and hunt, you have access to it nowadays with manufacturers putting out more options at higher qualities than any other time. Decide which rifle scope matches your Marlin 60 the best, get it on your rifle and get in the field! It doesn’t do you any good to have the best scope for Marlin 60 in the world, sitting on your shelf.